The disagreement doesn’t have any direct impact on consumers, but since the merger does, and the disagreement is being described as a “deal-breaker,” it’s worth explaining a bit. If the deal goes through, United will pay Continental in United shares. Continental wants to use a stock price from before news of a possible merger broke, but United wants to use the price from the day before the merger is formally announced, if and when that happens. According to the Times, “under Continental’s methodology, the airline would receive more United shares … under United’s methodology, the exchange ratio would be much lower.” The difference between the two airlines’ target prices is roughly 20 percent at this point, so we’re talking about a serious difference in shares. OK, now that all that financial stuff is out of the way, what does it all mean? Up until this snag, the deal appeared to be on track. Both sides had already agreed on a name (United), and at least part of its executive structure. United CEO Glenn Tilton, also, has been a very outspoken proponent of airline industry consolidation, and, presumably, would not let the deal die without a fight. And yet, signs point toward the merger possibly falling apart. 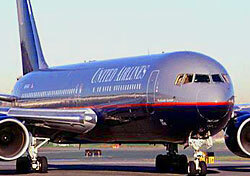 The Times writes, “[Continental CEO Jeff] Smisek has said recently that Continental would consider bulking up ‘defensively,’ suggesting that the airline might be content to remain independent with a merger of United and US Airways now unlikely.” United is also considered to have more to gain, and is seen as the weaker half of the pair. For consumers, such a merger might not be a great deal. As our own Ed Perkins observed a few weeks ago, mergers are not pursued in an effort to improve the customer experience. Airlines like mergers because they reduce competition, consolidate capacity, and lower costs. In one swoop merged carriers boost their profit margin and mitigate the pressure to lower fares. Sure, consumers may enjoy some benefits, such as expanded route networks and more streamlined service, but these are minor benefits and not even unique, considering the interconnectedness already in place due to alliances and codeshares. The flip side, of course, is that the industry’s health and, if you take airline CEOs at their word, the very survival of the modern air carrier business, is at stake, with mergers the magic cure. There’s certainly some truth to that, for the reasons mentioned above—live together, die alone, you know?—and a massive wave of bankruptcies or other severe market corrections would likely be worse for consumers than a few mergers. Readers, what do you think? Would you like to see the United-Continental merger succeed? Do you think the merger will have any affect on your travels?